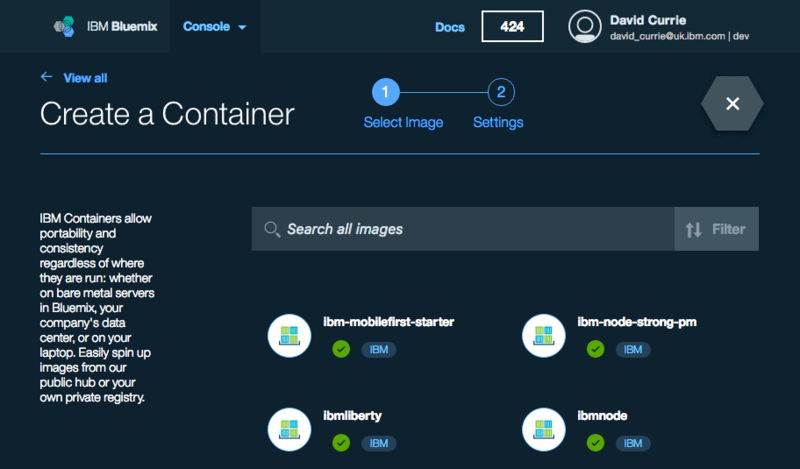 I wanted write a few blog posts as I explored deploying our WebSphere Liberty Docker image on to third-party cloud platforms but this didn’t really feel fair given that I haven’t written anything here about the options using IBM’s cloud platform! 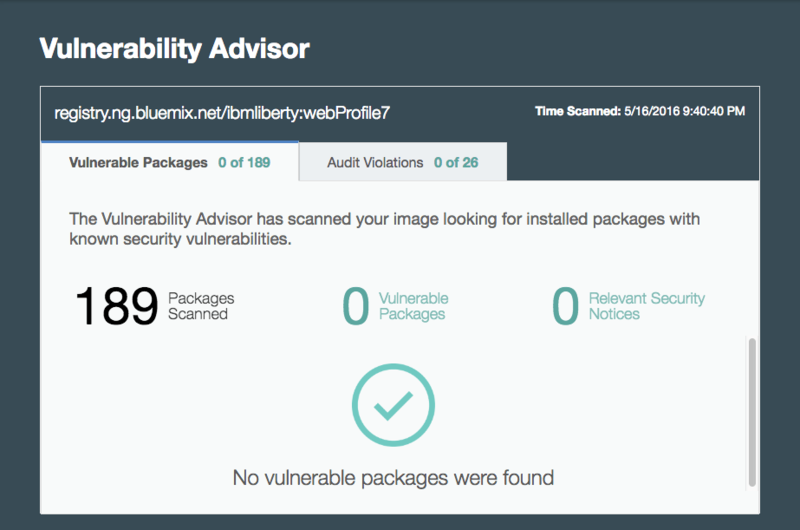 So, to kick things off, here’s a series of posts on using Liberty with the IBM Containers service in Bluemix. In this post I’m going to focus on using the web UI to get a simple Liberty container up and running. In subsequent posts I’ll cover topics such as deploying an application, scaling applications and using the command line. I’m also going to use the new console for the instructions/screenshots in this post. If you don’t already have an account, use the sign-up button at the top right of the console to get a free 30-day trial. 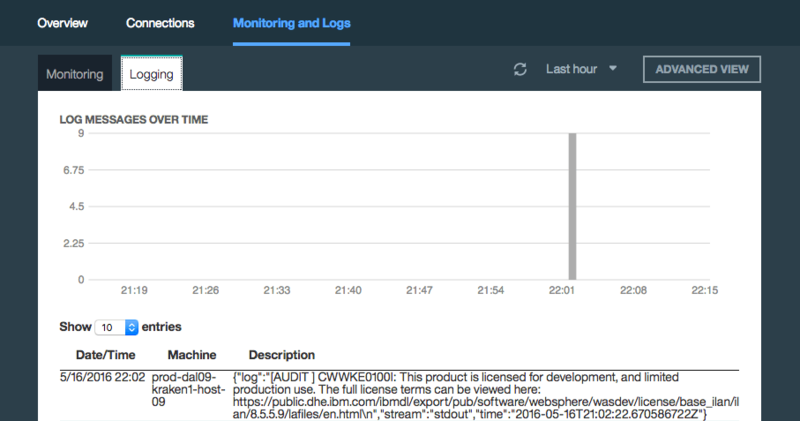 You can use WebSphere in a number of different ways in Bluemix: web applications deployed as Cloud Foundry applications will use the Liberty runtime and it’s also possible to stand-up WAS ND topologies for both Liberty and the traditional application server in VMs. Here we’re going to focus on containers. Once logged in, select the Compute icon and then the Containers tab. Then click the + icon top-right to create a new container. You should find that the private registry associated with your account is already populated with a number of IBM-provided images as shown in the following screen shot. Select the ibmliberty image. This image adds a few layers on top of the websphere-liberty image from Docker Hub to make it run more cleanly in IBM Containers (see the Dockerfile in the docs for full details). You will now see a drop-down on the left which allows you to select the image tag to use. By default the latest tag will give you the full Java EE7 profile image. Select the webProfile7 tag to get a lighter-weight image. Beneath the tag you’ll an area entitled Vulnerability Assessment which, if we’ve been doing our properly, should say Safe to Deploy. Assessments are updated regularly as new CVEs are announced and we therefore regularly refresh the image to make sure that it stays clean. At the top of the page, you’ll see that the Single option is selected to create just a single container instance, we’ll return later to see how the Scalable option works. Give the container a name. 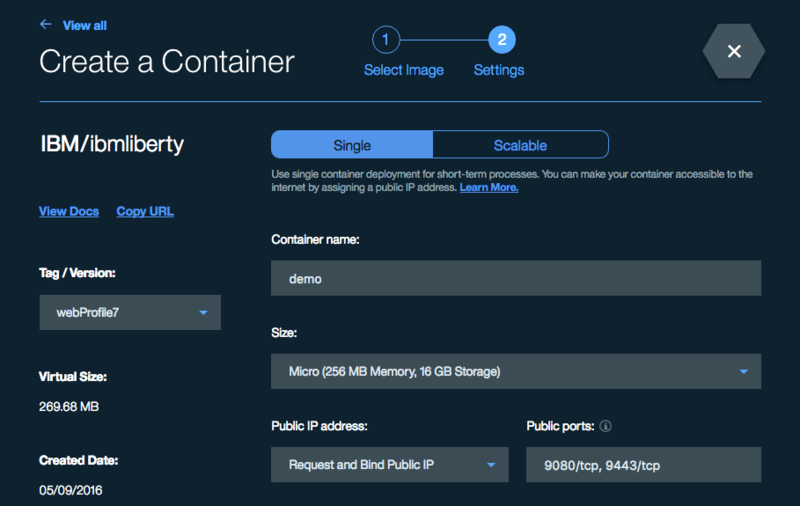 Leave the container size at Micro but select the option to Request and Bind Public IP. All containers get an IP address on a private network and are accessible by other containers in the same space but to be accessible externally they must be assigned a public IP. Now click the Create button at the bottom of the page. After a minute or two the status of the container should change to Running. Switch to the Monitoring and Logs tab. The container level metrics around CPU/memory/network usually take some time to appear but if you select the Logging tab you should be able to see the messages output by Liberty as the container started. Tip: you can use the ADVANCED VIEW button on these tabs to open up Grafana and Kibana views on to these metrics and logs respectively if you want to do more detailed analysis. Finally, switch back to the Overview tab. If you scroll down to the Container details section, you’ll find a list of ports. If you click on 9080, this will open a new browser tab using that port and the public IP address assigned to the container. With the default image, that should show the Liberty welcome page. This entry was posted on Monday, May 16th, 2016 at 9:32 pm	and is filed under Docker, WebSphere Application Server. You can follow any responses to this entry through the RSS 2.0 feed. Both comments and pings are currently closed.